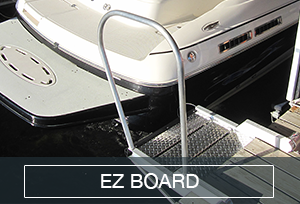 Click to view our full line of “easy in easy out” dock accessories and ladders. 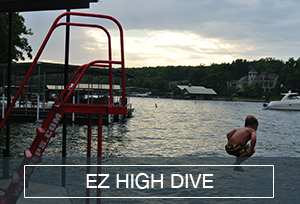 Easy install and aluminum construction made in the USA – Lake of the Ozarks, Missouri. 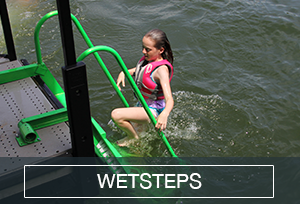 Making life easier & safer for everyone to get in and out of the water. The ladder is fantastic! 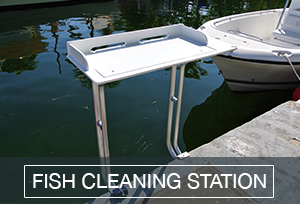 We had our first full summer of use last year and it’s one of the best things we’ve ever added to our dock. It’s exceptionally well built and we’re confident it will last for years and years. Whether young or old, it works great – as easy as walking up a few steps. The young grandkids loved it too as they could easily get out of the water and back on the dock ready to jump in again. We’d recommend it to anyone; it’s a fit for every application. Hi guys! I just wanted to say THANK YOU for taking such good care of my parents when they picked up their Wet Steps. They were so excited to install them that by the time we arrived the next day, they were already in! They have already bragged on and on to the neighbors about the steps and how great her kids are for getting this for them. (smile). It was a fool-proof investment as well as Christmas present all in one. The neighbors intend on getting some for their places too. They delivered the dock yesterday and installed the ladder. All the neighbors had to come look! John Wolfe, the owner of Krantz Docks, even commented on how much he liked it. He also said that you had left some brochures at their office and he had already mailed one to a customer. 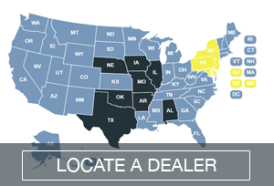 Hopefully, you will draw another sale off of ours! Thanks again! Can't wait to get an opportunity to use the ladder! We just shared a wonderful week with our family and I can't explain my gratitude. Our daughter-in-law isvery handicapped from "MS", and the steps made it so much easier forher to get in and out of the water. An added bonus, my husband has not been able to get into the Lake for two years because of an ankle problem. It was wonderful to see him enjoy the water again. Your steps I am sure will help many people just as it has helpedour family. As for your service, there is only one word to use "OUTSTANDING". We just shared a wonderful week with our family and I can't explain my gratitude. Our daughter-in-law isvery handicapped from "MS", and the steps made it so much easier forher to get in and out of the water. An added bonus, my husband has not been able to get into the Lake for two years because of an ankle problem. It was wonderful to see him enjoy the water again. Your steps I am sure will help many people just as it has helpedour family. As for your service, there is only one word to use "OUTSTANDING". Again I thank you.